For 30 years, CDA has been designing, manufacturing and adapting its packaging machines to many line of business. Thanks to an in-depth expertise in the packaging of varied containers (rectangular, oval, cylindrical, conical products), the filling (fluid, pasty, viscous, foamy liquids) as well as the screwing (cap with security, spray, pump, etc. 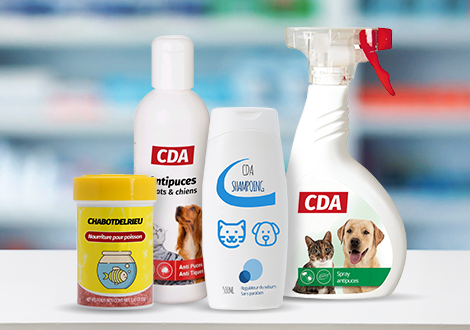 ), CDA leveraged its competence for the packaging of every type of products, meant to the animal market: cat/dog shampoo, insecticide, flea-bomb, fish food, animal food supplement, animal oral hygiene products, etc.) From the small animal laboratory to the large groups manufacturing veterinary products, our complete range of semi-automatic and automatic solutions allows us to offer the most adapted solution, regarding the forms and formats of the products, the speed wanted or the specificities of corrosive products or special caps. When it comes to package significant productions of veterinary products, an automatic labelling machine becomes essential. According to the forms and formats to be packaged, CDA will offer you one of its labelling machine for conical, cylindrical, rectangular or oval products, with labelling on the sides, bottom, top or wrap-around. The big formats of veterinary and animal products or the large groups packaging big volume and looking for high-speed will find the answer to their needs of filling within the CDA automatic filling machines range. Our filling machines are suitable to different formats and have various pumps, depending on the viscosity of the product to fill. Our experts guide you in the choice of your filling machine. CDA offers to its clients two models of complete packaging lines, which handle the filling, the screwing as well as the labelling with only one compact machine. Ask our team for advice to compose the packing line adapted to your veterinary and animal products range. Pets are presents in over half of world’s households. Therefore, many markets related to animal health, animal cosmetics or animal treatments have appeared and increase, with the rising trends concerning animal well-being. Laboratories, independent producers and large groups develop nowadays large range of products for our pets: dog, cat, rabbit, rodent, fish, bird, horse or exotic pets. In order to feed, care and watch our pets well-being, very specific products have been produced and have to be packaged, complying rules and particular constraints. Animal cleaning products with books label and compulsory indication, food supplement with security cap, flea-bomb, animal essential oil, animal shampoo and other lotions, elixir and food boxes have to respect a certain number of constraints during the packaging. Used to the diversity of products that can represent a business line as veterinary and animal products, CDA’s machines are available in a semi-automatic range and an automatic range for the labelling of every formats and forms of products, on the sides, bottom or top, the filling of fluid, pasty, viscous, foamy liquids, as well as the screwing of standards caps but also pump and spray caps. CDA expertise will help you finding the labelling machine, the filling machine or the complete packing line made for your products range. The smallest productions of animal dermo-cosmetics, food and veterinary products will opt for a semi-automatic machine, in order to maximise the packaging of their animal shampoo, lotion, elixir or food supplement. Our semi-automatic solutions will allow you to make the first move to automation or for a large group, to package a new range launch. Large veterinary groups are often yet equipped with automatic machines. Therefore, they want to enhance their packaging lines with reliable and adaptable tools. CDA provides his savoir-faire for the acquisition of a CDA complete line or the optimization of a current one.